Going into the afternoon of November 8, my expectations were, admittedly, not high. Rut movement (especially buck movement) was slow. 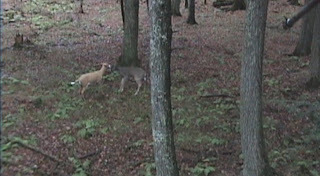 Deer were beginning to chase on the fields, but the story in the timber was much different. As I prepared to head to the stand for the evening, I put the final spray of scent killer on "Judas" the decoy. Only this time, I opted for "Judy" the antlerless decoy. Mind you, I didn't have the antler caps so it might have looked more like a nubby buck. I felt it was time to mix things up and at least keep myself entertained with a new stand choice and my first time using a decoy. I headed past a stand we call the Waterhole and opted to sit the setup called Leaning Tree. It's only about 60 yards from Waterhole, but offered a bit more open view for the deer to see the decoy. Also playing into the stand choice was a sighting of a decent buck chasing a doe which took place a couple days earlier while I sat in Waterhole. The pair ran within shooting range of Leaning Tree, which is situated at the funnel entrance point between a small tamarack swamp and the base of a hill which has seen active logging this fall. We had set the stand 2 or 3 years ago based on a heavy runway, but the stand saw limited action. But, logging activity seemed to make it a desired deer route this year. As I approached the stand, a spike was surprised by a tall figure with a doe towering over it's head and opted not to stick around to see what the deal was. He headed for the funnel. 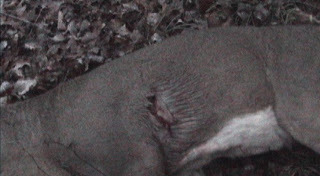 With the decoy placed at 18 yards, quartered away, I worked a bleat call periodically. It wasn't long before the spike came back for a second look. He approached cautiously and then put what small amount of dominance he had to work. He was stomping and posing in front of the decoy, looking for some reaction. He then proceeded to close the distance to approximately 15 yards. At this point, the spike put his instincts into action, as he made a scrape under the limb of a fallen branch. Mind you, his choice of licking branch resembled the tree that Charlie Brown picked out so many Christmas' ago. But, I felt for the little guy. His confidence grew, as he approached the decoy. My suspicion is that the lack of head caps on the antler holes of the decoy presented a nub buck, spurring this 'aggression'. Just as he came nose to nose, I broke into a series of snort wheezes which sent the challenger back to his 15 yard safety circle. He worked the area for scent for a while then off he went. The next to appear was a doe group, counting 3, approaching from the north. They approached very low key...until they saw the decoy. I figured it was all over for them, but the large doe in the lead position took it upon herself to get a closer look, constantly bobbing and stomping. After a short period, she backed down to 'Def Con 1' and fed on hemlock tops and ferns along with the other two yearling does. Soon after, another doe approached from the west, descending from a sizable logged ridge. She had that nervousness about her that every hunter loves to see during the rut. The over-the-shoulder look combined with the twitching tail. But, five minutes passed with no buck. Then on the other side of the funnel, to the south, I could see a buck crossing at a decent pace about 100 yards out, disappearing behind the logged ridge. Minutes passed until (what I believe to be) the running buck came to the ridge top. But, he did not descend as the doe did. Instead he worked the ground with his nose, staying along the ridge top until he disappeared over the back side of the ridge, near the location of where the does came from. "Hmmm, guess she's not hot", I thought to myself. I didn't feel he was a shooter, but wanted to get a better look. 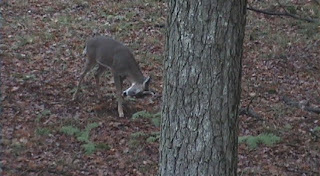 So I began a doe bleat sequence, figuring he was looking for some 'action'. It wasn't long before I could hear the crash of a running buck, but not from the direction I anticipated. Instead, the two different bucks busted in, trotting down the logged ridge. I could see the one in the lead was heavy, tall, and wide and it looked to be an 8 pt. from the front. By now, the sun was set and details were faint. I remember whispering out an expletive when they committed to coming into range. Like a fly to a light bulb, the lead buck headed stray for the decoy, the trailing 8 pt. buck following like a wing man. As the lead buck cleared the hemlock branches that provided my cover, I was at full draw. I gave him the usual "Meh, Meh", but there was not stopping him until he met the decoy nose to nose. Just as he made it to the decoy, I recall thinking, "I better take him now, or that decoy is toast." By this time his rack was in front of a tree and I could really make it out. He was only a six! But, his body looked all of a 4 year old. The adrenaline was pumping now...Thwack! The six pt. mule kicked and I new it was a good, clean hit. I watch as he ran toward the funnel. By this time I had lost track of the trailing buck and it didn't really matter. Because within moments, I made out my buck in the near distance as his front legs gave out. His chin hit the ground, followed by a sweeping rump. As the rear hoofs came to rest, I released all of my tension..."Yes! Yes!". The deed was done. 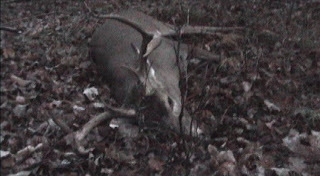 My bow season for bucks was done and I had a freak on the ground. I think he broke the 100" mark which doesn't sound like much, but breaking that boundary with six points? That's a trophy six. Oh, and if you read my blog on the broadhead challenge, I'd say the Rage passed the field test.